Where: Toyota Centre Houston TX. Bench: Louis Williams, Ryan Anderson, Sam Dekker, Montrezl Harris, Kyle Wiltjer, Chinanu Onuaku, Troy Williams, Bobby Brown, Isaiah Taylor. Bench: David Less, Manu Ginobili, Jonathon Simmons, Dejounte Murray, Kyle Anderson, Davis Bertans, Bryn Forbes. *injured in game 5, may not be available. 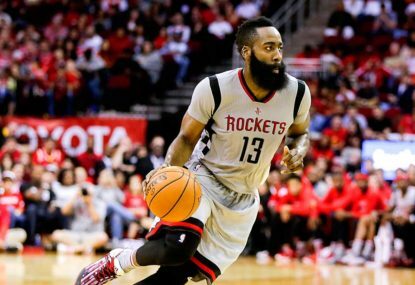 It’s a do or die battle for the Houston Rockets as they travel across the state of Texas to face the San Antonio Spurs in game 6 of the best of seven NBA Western Conference semi-final series. Join The Roar for a live blog of the match, starting from 10am AEST. The first five games have been a back and forth battle between these two teams with four double-digit wins, but game 5 was a close hard fought battle between these two the teams needing overtime to ultimately get the result. The Spurs suffered what could be a series-changing injury to their star and outside MVP chance Kawhi Leonard. Leonard sprained his ankle during game 5 and was not available to play in the late stages of the game, missing the entire overtime period. Missing Kawhi for the late stages of the game didn’t hurt the Spurs in game 5 but without him for an entire game could be more costly given what he brings to the team both on the offensive and defensive end of the court. The Rockets and their reliance on the three-point shot has helped them throughout these playoffs however as we have seen in previous games when their three-point shot is not falling they are unable to get the points in other means. James Harden had another triple double in game 5 but it was not enough to power the team to victory in overtime and he struggled in the fourth and overtime period. Harden had a chance to tie the game for the Spurs at the end of overtime but his shot was ultimately blocked by Manu Ginobili. If Kawhi Leonard is unable to suit up San Antonio may require a big game from LaMarcus Aldridge who has really struggled to make a mark in the playoffs so far. If he can get going it will not only boost the Spurs’ chances of getting the win over Houston but give him some more confidence which will be vital for the Western Conference finals if they are able to make it that far. Houston will need to see an improvement from Lou Williams and Eric Gordon who both struggled to make a mark in game 5 going a combined 1/11 from the three-point line, this Rockets team is built around the three-point shot and when one or two of those players are struggling it can prove costly for the team, which it ultimately did in game 5. Another point the Rockets will need to work on is to minimise their turnovers – they finished with 16 for the game and a key steal late in the fourth gave the Spurs the chance to tie up the game and force the overtime. With Kawhi Leonard hobbled by injury the Rockets have a big chance to jump the Spurs and even up this series, the Rockets will not have another bad shooting game like they did in game 5 and knowing it is a do or die game for them they should be able to do enough to get the win. Join The Roar for a live blog of the match, starting from 10am AEST.